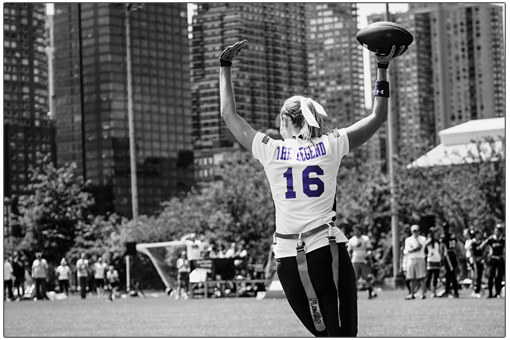 Alzheimer's Association RivALZ is a volunteer-driven event that engages young professionals in friendly but fierce flag football games around the country. As part of the competition, teams are organized around age-old rivalries — East vs. West, Blondes vs. Brunettes, City vs. Suburbs — that inspire fundraising, awareness and action in the fight against Alzheimer's disease. RivALZ began in the fall of 2005 as Blondes vs. Brunettes®, a flag football event founded by a group of professional women: Sara Abbott, Andrea Rodgers, Kristyn Noeth, Kate Stukenberg and Meredith Riddle Chastang. The founders of the event have a personal connection to Alzheimer’s and designed the event to drive awareness among a younger audience while raising funds for the Alzheimer’s Association. Since the inaugural game in Washington, D.C., the event has grown to more than 40 cities, raising more than $13 million and bringing thousands of new supporters to the cause. In 2014, to accommodate nationwide growth, “Blondes vs. Brunettes” grew into “RivALZ,” empowering participants to choose the rivalry around which to organize their teams. The funds raised through RivALZ benefit the care, support and research efforts of the Alzheimer’s Association. Take the first step today by finding an event near you. Once you register, you will have access to a wide range of tools and support through your Participant Center, ensuring a rewarding experience that will help you succeed in the fight to end Alzheimer’s!